AADL (Alberta Only) - The Alberta Aids to Daily Living program provides funding for mobility and other equipment and supplies to Alberta residents with long term medical needs. 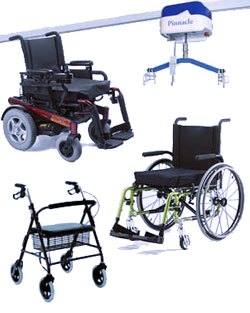 ADP (Ontario Only) - The ADP Program is an Ontario Ministry of Health program to provide funding for mobility and other equipment and supplies. Canadian Sources - This section of the web site has information on funding programs that are available federally and by province. Medicaid (USA) - For our US visitors information on the Medicaid Program. Medicare (USA) - For our US visitors information on the Medicare Program.